I've made this list in hopes that someone from Buena Vista (Disney) is paying attention. If ANYONE knows someone related to the company PLEASE point them in the direction of this website so that we can hopefully get the DVD made the right way! 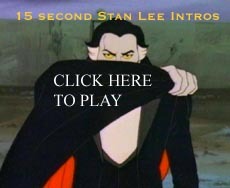 In the summer of 1981, two television stations (KDKA Pittsburgh and KPIX San Francisco) co-produced a special on how this cartoon was made, including interviews with many of the shows creators and it was hosted by Stan Lee. It was 30 minutes long and is better than any documentary that you could make today. It is absolutely invaluable and should DEFINITELY be included in a DVD release. Buena Vista has yet to release a DVD for a Marvel cartoon that has suitable cover art. This is a 1980s cartoon that was HEAVILY influenced by the comic book art of JOHN ROMITA SR.. Please reflect that. I am an artist and am more than willing to draw covers for any releases of this show. PLEASE CONTACT ME: I have many examples that are perfect for this. The show had three seasons and had a different intro each year. The first year's intro is the same as the one shown on ABC FAMILY & TOON DISNEY. The second season had an intro called THE INCREDIBLE HULK AND THE AMAZING SPIDER-MAN. 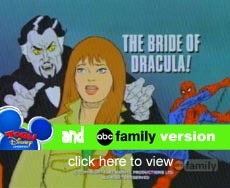 The third season had an intro called THE AMAZING SPIDER-MAN AND THE INCREDIBLE HULK. You can click below to view them. They would be welcome as a special feature on a DVD release. All DVD enthusiasts and comic book fans want as many special features as possible. We'll take what ever we can get. We would love Audio Commentary from any creators, storyboards, scripts, character designs, a feature on the fabulous music of John Douglas...anything and everything we can get. Again...PLEASE CONTACT ME. I can help you with all of this. I have been in touch with most creators and know how to reach them. I hope you realize the value that any of these could add to a DVD release. I await a response and can be contacted at the address below.